The problem: you probably don't have piles of extra money just lying around to just write a check for all the startup expenses, right? Often, you can simply finance your food truck - but it can be really hard to figure out online who qualifies to do that and how. Today, I'm going to fix that problem and show you what it will take to qualify for food truck financing. Exclusive Bonus: The most important question most people have when researching how to get a loan for a food truck is how much down payment they'll need. We've created this free guide to understanding the down payment you'll need to finance your food truck. So, How Much Does it Cost to Start a Food Truck Business? I just mentioned that opening a food truck business costs much less than opening a restaurant. How much less? There is a considerable range of opening costs between different styles of restaurants, but most studies come pretty close in agreeing with an assessment from Inc. Magazine: it can easily cost $500,000 to start a restaurant. In comparison, the costs to start a food truck are much, much cheaper. 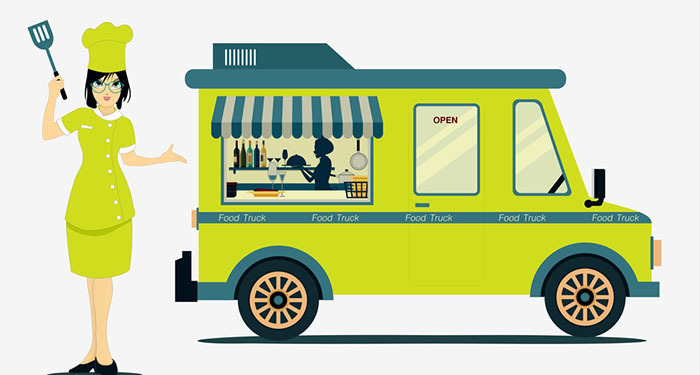 In a recent article, The Complete Breakdown of Food Truck Operation Costs, the Foodtruck Empire website estimates startup costs to range from $28,100 to $114,100 - or 1/20th to 1/5th the cost of opening the average restaurant. Most new business owners will end up in the middle of that range, around $60,000, with 90% or so of the cost being the actual truck. (A less expensive option for some could potentially be a food concession trailer, but it would depend on your business model). So, Can You Borrow Money to Finance a Food Truck? Much of the time, you will be able to borrow the bulk of the money needed to finance your truck. However, if you have no money at all, you should probably find a way to remedy that situation before starting a business. No matter how good your business plan is, and no matter how awesome of a Korean goat cheese taco you can make, lenders have to take into account the risk in lending to you. How much money are you starting the business with? Are you someone that should be lent to? Let's go over these questions really quickly to give you an idea of what potential food truck financing companies are looking for. (Note, if you already have a food truck business, and either need to replace your existing truck or are expanding, the stuff below applies, but it is obviously easier for an already successful business owner to get financing than for someone who is just starting out). 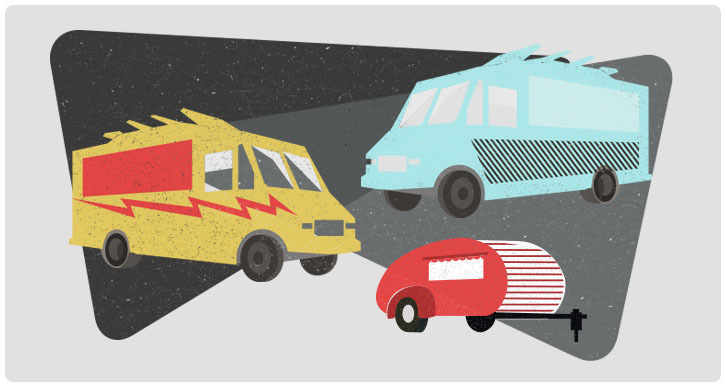 What about Financing a Food Truck With Bad Credit? So, having an 800 credit score doesn't hurt, but it isn't totally necessary to have perfect credit when you are financing a food truck. You may have some problems if your credit is super-bad though. Here's the rule of thumb. With a 600+ credit score, if the rest of the equation points to you being a good fit for financing, you'll probably be A-OK. If you score lower than 600, you'll probably have to come up with something the lender can take if you don't make your payments. How Much Money Do You Need to Start a Food Truck Lease? This is always the biggest question, and we break it down more in our guide to food truck down payments, but you should be starting with SOME money. I know, you're probably looking at your monitor funny right now, but believe me, I get calls at least once a week from someone that doesn't have two nickels to rub together who needs a loan to start a business. As much as I'd like to help those people, nobody on earth will lend money to someone who is going to start the business being broke. Here's what to look for: First, consider all the money you have. Now, deduct the amount of down payment you'll need. Is there at least a few thousand dollars left over? If not, maybe you're not ready just yet. There isn't going to be enough "wiggle-room" for lenders to feel comfortable - and you really don't want to start a food business and not have enough money for things like food. You should probably start selling your stuff until you've got that cushion. What Else Do Food Truck Leasing Companies Look for? First, do you have any experience? While not 100% necessary, having had experience either in running a food truck or at least in the restaurant industry definitely puts one in the plus column when someone is thinking of financing you versus someone who saw something on TV and thinks food trucks sound like a pretty neat business. Second, are you smart enough that you could run a business? Okay, I realize you're shaking your head right about now, but the truth is, about a third of the people I talk to are not smart enough that they're likely to make the business work. The way we figure that out is simple: do you know your numbers? How much revenue (sales) do you expect that equipment to generate? In fact, your best bet is to come prepared with a 1-2 page simple business plan. In most cases, that plan is totally unnecessary, but it will help show a lender that you've got a handle on what it will take to make the business succeed, and those just happen to be pretty good things for you to know before going and buying some expensive equipment. One of the last, but most important things a lender is going to look at: the truck. First off, we don't like to talk about it, but whether we're talking about food trucks, or restaurants, or bouncy ball businesses, half of the time, you're going to fail. Of course, our goal is to only lend to the half of new businesses that aren't going to fail, but it doesn't always work out that way - so when a borrower doesn't make the payments we have to take the truck. Of course, the newer the truck is, and the better condition it is in, the easier it is to sell it. Secondly, but almost as important, we get a lot of calls from folks in all sorts of industries that want to have the lowest payments possible, which means buying some cheap piece of crap. Let's put it this way: if you want to get started by buying some old roach coach from when Jimmy Carter was president, you're more than welcome to do that, but it's going to be hard to find somebody who wants to finance it. Protip: If you haven't picked out your food truck yet, check out www.foodtrucksellers.com which lists just about every seller and custom food truck builder in the U.S.
You'll also obviously have to make sure the food truck you're buying is insurable. Not many insurers understand food truck underwriting, but there is one insurer in the U.S. that specializes in insuring food trucks and trailers. Before you plunk your deposit down, you may want to check on insurability (and rates) with Insurance4foodtrucks.com or Insure My Food Trailer. (Usually you're best off buying something 15 years old or newer, and in the best of worlds, not more than 10 years old). How Much Does it Cost to Lease a Food Truck? Unless you're going through a bank, you're not really doing a loan - the transaction will 99% likely be structured as a lease though options at the end differ - you might need to pay $1 to keep the truck at the end or 10% but it is still a lease. Since we were just talking about not buying the cheapest piece of junk you can find, let's talk about what payments would actually be for a food truck. Let's assume you're buying a $40,000 truck. Let's say you've been at it a few years, and you're buying a second food truck. Also we'll assume you've got good credit and business has working out well - basically someone would either have to be a moron or work at a bank to turn you down for a loan. On a 4-year term, payments could easily be as low as $900 per month depending on how the end of term options were structured. Let's say you're a startup, though. Remember that part about half of startups not making it? As a newer business, or if you have credit problems, a lender company has to price in that risk to justify making the investment in you. Payments on a $40,000 truck for a startup could be as low as $1,200 but reality is that they'll usually be higher. The range will usually be $1,200 to $1,550 - but for really bad risks like where you're trying to start a business with lousy credit if we can actually find a funder crazy enough to take the deal, costs would have to be higher. PS - yes, those are high rates. Find me someone who will tell you he can lend to startups at low rates and we can both share a story about somebody that ripped you off... it happens way too much. So, How High are Rates to Lease a Food Truck? For established businesses with decent credit the rates are, well, decent. They can vary but the finance charges are under 10% per year of the total amount financed (so if you financed $50,000 your finance charges will be less than $5k per year of financing). New in business or bad credit? Let's not talk about the rate. Seriously, knowing the rate will only convince you never to open a business, and that would be a big mistake, because somewhere a parking lot full of people seriously need to learn what your grub tastes like. Just click on the button in the image below.